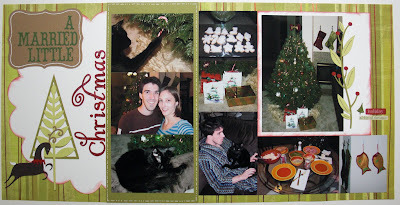 Warren’s and I first Christmas as a married couple. And probably our last Christmas by ourselves. It was wonderful spending the holiday together in our new apartment with our first real Christmas tree. 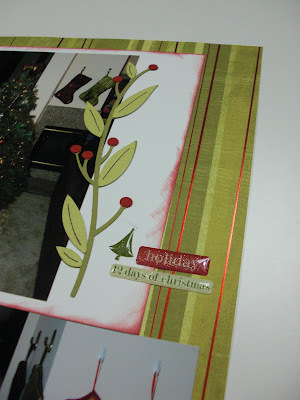 Details: Striped paper is by Deja Views Retro Hip Christmas line exclusively for Archiver’s. Epoxy stickers on right page by Making Memories Fa La La line. “Christmas” is also from the Making Memories Fa La La line – glitter stickers. 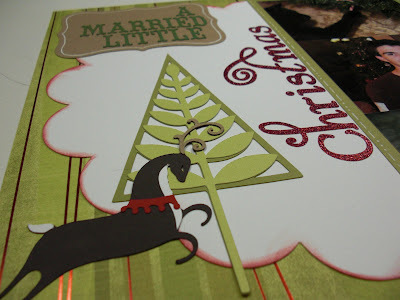 “A married little” was cut using the Storybook Cricut cartridge. Vine, tree, and reindeer were all cut using the Joys of the Season cartridge. White scallop cut using Mini Monograms. Wow! I love this. It is beyond adorable. Love all of the embellishments too.